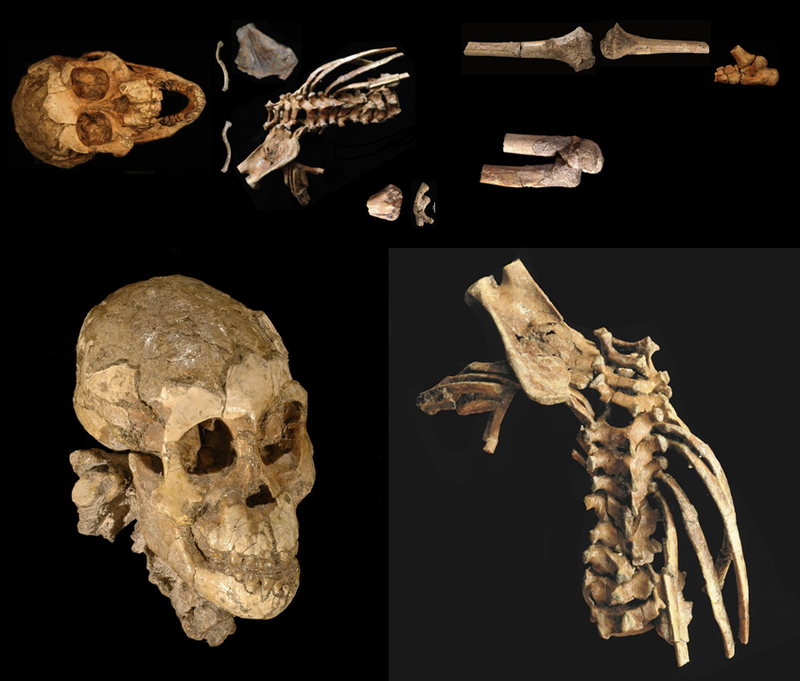 After the Taung boy, one of the most famous infant hominin individual is Dik-1-1, an almost complete skeleton of Australopithecus afarensis dated to 3.3 million years (Ma). It was found between 2000 and 2003 at the Dikika site near Hadar, Ethiopia, by Tilahun Gebreselassie from Zeresenay Alemseged’s team of the Max Planck Institute of Evolutionary Anthropology in Leipzig. Bernard Wood called this find “A precious little bundle“. It took six years to separate the bones from the cemented sediment where they were found. It was nicknamed Selam (which means Peace in Amharic) and also Lucy’s baby, although in recent times there is a greater use of the alias Dikika Baby. Based on the dentition, the date at death is estimated between 3 and 4 years old. All the deciduous teeth were present, and the first molars crowns were not erupted but were fully formed. The skull has similarities with other Australopithecus skulls, such as Taung-1 or the juvenile afarensis AL 333-105. The cranial capacity was 235 cc, and would have reached 425 cc in the adult age. The brain of Au. afarensis shows a slow development, approaching that of humans, but the dentition has a faster development closer to that of African apes. Dikika Baby would be around the end of the lactation period. It retains the hyoid bone, which is very difficult to find fossilized. Selam’s hyoid has a cavity in its base that serves as an air sac system like in Pan, while this bone is flat in Homo. Therefore, Dikika Baby would emit sounds more similar to those of a chimpanzee than to those of a human. It was fully bipedal, as expressed by the position of the foramen magnum and the leg bones. However, the scapula and the curved finger and toe bones indicate some retained arboreal life, with ability to climb and swing, as has been observed in other specimens of its species. The environment in which its lived consisted of herbaceous meadows and gallery forests. The morphology and organization of the spine presents a transitory form towards the human and less similar to that of the African apes. It has 7 cervical vertebrae and 12 thoracic vertebrae like humans (while African apes have 13). Hadar, only 10 km to the north, is the site of the discovery of Lucy and The First Family (a fossilized group of 17 Au. afarensis individuals). Gona to the west, where a collection of 2.5 Ma stone tools was found. Middle Awash to the south, an area of multiple finds of hominins from various periods, such as Ardi (Ardipithecus ramidus, 4.4 Ma), Bodo (Homo rhodesiensis, 600 ka) or Herto (Homo sapiens, 160 ka). Esta entrada fue publicada en Fósiles y etiquetada Afar, Australopithecus, Australopithecus afarensis, Dikika, Gona, Hadar. Guarda el enlace permanente. ← ¿Neandertales cerca del círculo polar ártico?